The following is my interview with Colby Morita. 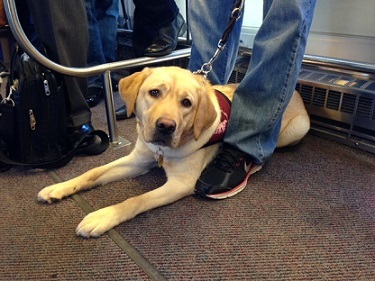 Colby is a volunteer puppy raiser who has raised puppies for Guide Dogs of America and Canine Support Teams. I’m interested in becoming a puppy raiser myself at some point, and I’ve followed Colby’s blog Puppy In Training for several years. If you are interested in how to become a puppy raiser, Colby shares some really helpful tips on how to get started and what to expect. That Mutt: Why did you decide to become a puppy raiser? Colby Morita: I’ve been volunteering as a puppy raiser for nearly eight years now. It all started back in 2006. Back then I spent a lot of my free time volunteering with non-profit organizations including Habitat for Humanity, Working Wardrobes and Special Olympics. I truly enjoyed helping people in need, but I also had a love for dogs and wanted to spend my time helping both dogs and people. This revelation coincided with America’s Family Pet Expo and while visiting the Pet Expo in 2006 I inquired about the many different volunteer opportunities with rescues, shelters and of course puppy raising programs. I was a little hesitant about becoming a puppy raiser because the time commitment is quite long. Most puppy raising programs require volunteers to raise puppies from 8 weeks of age until 18 months. So instead of becoming a puppy raiser I started off my career in the doggy volunteer arena as a foster for one of the local animal rescues. The thought process back then was fostering was a more short-term deal (not always). If I could handle having an extra dog (I already had Linus) for a few weeks to a few months then I would be okay moving on to a more long-term commitment like puppy raising. I fostered over a dozen dogs including a litter of seven German shepherd puppies! After completing my self-imposed apprenticeship as a foster parent I decided I was ready to make the long-term commitment of becoming a puppy raiser. TM: Is it difficult to get accepted into a puppy raising program? CM: I’m sure it’s different for every person who applies to one of the service or guide dog schools, but for me it was not all that difficult. 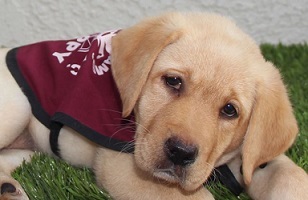 The schools are looking for all different types of people to volunteer as puppy raisers. We had our Guide Dogs of America monthly group meeting last week and one of the prospective puppy raisers was concerned about her level of experience with dogs so we went through our group and each of us talked for a little bit about our experiences before we became puppy raisers. I had dogs my entire life growing up from family dogs, to rescues, to shelter pups, as well as volunteering as a foster. Surprisingly, several other puppy raisers were taking a dog into their house for the first time as puppy raisers. Schools look for all different kinds of people to raise their dogs because when dogs start working they can be matched with all different kinds of handlers. Some have never had dogs before, some have had dogs their entire lives. People often tell me that they’d love to raise, but they can’t because their condo doesn’t have a backyard. Again, these working dogs will end up in condos, houses, mansions, etc. They may live in the snow or the desert. The goal of the school and our goal as puppy raisers is to expose our pups to as many experiences as possible. Even though I’ve been a puppy raiser at two schools, Guide Dogs of America and Canine Support Teams, I’ve actually seen the inner workings of Canine Companions for Independence, Guide Dogs for the Blind, Tender Loving Canine Assistance Dogs and Little Angels Service Dogs as I went through the application process and also did some volunteer work with all of these schools. Sorry, back to the question. Is it difficult to get accepted into a puppy raiser program? As long as you have the time, commitment and support (from your work, school, family, friends, etc.) I don’t think you will have difficulty getting accepted to a puppy raising program. TM: What are some of the responsibilities of a puppy raiser? CM: I guess we can break this down into behavioral responsibilities, monetary responsibilities and other responsibilities. Behavioral – The main behavioral responsibilities of a puppy raiser are to teach your puppy basic obedience skills, good house manners and socialization. Schools will teach you these things through their puppy raiser manual, group meetings, group outings, puppy sitting, training classes and probably a few other things I can’t think of off the top of my head. Monetary – GDA covers most of your puppy expenses besides food and toys. On the other hand CST puppy raisers are responsible for most of their puppy’s expenses. Expenses will vary widely depending on the school. Other – Each school will be a little different. GDA requires regular kennel stays and even though they cover vet costs they have to be done at the school. GDA also requires you attend a minimum of two obedience classes and attendance at monthly meetings is mandatory. GDA also highly recommends puppy raisers attend monthly obedience classes held at the school and participation in group outings (here’s a peek at our Orange County GDA outings calendar). I might be missing something here so if you have any specific questions about what you might be responsible for as a puppy raiser please leave me a comment below and I’ll make sure and answer your question in a timely fashion. TM: What are some of your tips for socializing a puppy? Socialize with different types of people and dogs – Men and women. Young and old. Different races, wearing different clothes, hats, glasses, outfits, wheel chairs, canes, etc. During our puppy kindergarten we have a day where you wear your favorite/craziest mask, we bring in walkers, canes, wheel chairs. We’ve seen some dogs that haven’t been exposed to these types of things react fearful when seeing something new or unusual. The dog part may be more specific for guide and service dogs, but a lot of times our puppies only see specific breeds: German shepherds, Labrador retrievers and golden retrievers. It’s good to expose your puppy to all breeds so they do not react excited or fearful when coming across any type of dog. Early Exposure and Safety – Early exposure is very important for our dogs. However, guide and service dog schools are very careful with their puppies. While it’s important for your puppy to socialize at a young age it’s also important for them to be safe from disease. Our puppies come home at around 8 weeks of age and have under-developed immune systems until they are fully vaccinated at around 16 weeks. So how do we socialize these little guys? We socialize and take them places we know are safe. When our pups are not fully vaccinated we avoid places that are heavily trafficked by dogs we don’t know like pet stores, parks and even our own neighborhood. We do go to safe places like puppy kindergartens (make sure the trainer checks puppy vaccinations and works in a clean environment), friends’ houses and public places where most dogs aren’t allowed like restaurants, grocery stores and workplaces (sorry, some of these will probably only work for guide and service dogs). Age Appropriate – make sure whatever activity you take your puppy out on is age appropriate. As puppy raisers, we like to get our pups out and about as soon as possible, but the world can be a frightening place. If you expose your puppy to something too early he may develop a fear of that place or thing. Make sure your puppy is OK with whatever outing or experience you plan on exposing him to and have an exit strategy. If the outing is too stressful, be ready to leave your outing. TM: What is the most challenging part of being a puppy raiser? I love every part about being a puppy raiser! However, there are definitely some challenging moments. A puppy will test your patience. Every puppy is different, but most will have at least a little bit of difficulty adjusting to their new home. The first night home with your new puppy is often the most difficult. You have to remember that this is your pup’s first night away from his litter mates and sleeping in a crate. When it’s time for bed you’ll probably hear some howling, but hopefully it only lasts a few minutes and not a few hours. Hopefully you’ll only have to wake up once or twice during the middle of the night. The good news is after a few days, sometimes a few weeks, your puppy will adjust and be happy as a clam when it’s bedtime and time to sleep in his crate. Saying goodbye and sending your puppy off to guide dog college is very difficult, but probably the most difficult decision I’ve had to make was after Derby was career changed (dropped from the program). At this point I was given the first option to adopt Derby (pictured above). My first thought when one of my dogs is career changed is: Is there another job he can do? I had Derby tested for Search and Rescue and Service Dog school. Unfortunately, he did not pass either test. At this point my two options were either to adopt Derby or to have him enter the GDA adoption program. This was definitely the most challenging part of being a puppy raiser. I thought long and hard about what would be best for Derby and in the end I believed he’d be better off with another family. GDA has a 6-year wait list for career changed guide dogs and they thoroughly check out each family and dog to make sure they find a good match for your puppy. Erin over at Chronicles of a Puppy Walker talks about this same situation when she had to give up her puppy, David, after he was career changed. 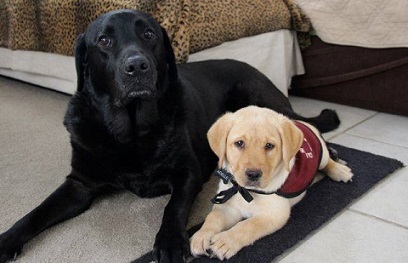 It’s one thing to give up your dog when it’s time for them to start formal training at guide dog college, but it’s totally different when you give them up after you have the option to keep the puppy you raised and trained for the past 18 months. TM: Do you have to work from home to be a puppy raiser? CM: Nope! You don’t have to work from home to be a puppy raiser, but you will have to get approval from your company to bring your puppy to the office every day. We have many different types of people raising puppies who also work. Puppy raisers work many different jobs from students, sales, real estate, IT, school teachers who all take their puppies to work. Of course not all jobs will be suitable for puppy raisers and not all work places will allow you to bring your puppy to work. When I first started out as a puppy raiser I first spoke to my supervisor then talked to the owner of the company. Lucky for me our organization is very supportive of both volunteering and the guide/service dog organizations. In fact, since I started volunteering for Guide Dogs of America my work office now donates their building for our group meetings and puppy kindergartens. TM: What does it mean if a puppy becomes a “career change” dog? Derby went into the GDA adoption program where he was adopted by a loving family. Apache was “career changed” to a service dog school (Canine Support Teams) and last year he graduated as a PTSD service dog. Hopefully that makes sense. 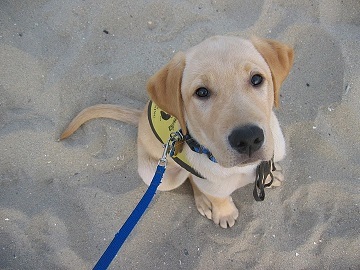 A career changed dog may not be suitable as a guide dog (for the blind), but can move on and still be a working dog. 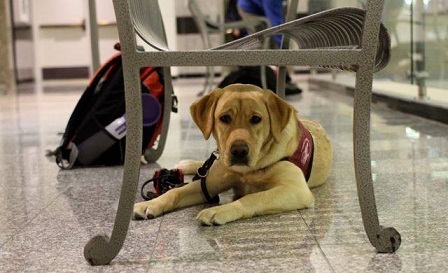 Many of the dogs from GDA go on to other careers as Service Dogs and also sometimes as Search and Rescue Dogs. TM: How do you say goodbye when the puppies go on to their formal training? CM: GDA has a nice luncheon when it’s time to send your pup off to college. It all starts with a letter in the mail about a month before turn in day. The day of turn in you meet at the school with the other turn in pups and raisers. GDA staff serves lunch and the puppy program manager talks about what your puppies will be doing over the next six months. After about an hour of lunch and pictures, raisers and puppies head down to the kennels and one by one your names are called and you walk your puppy down to the kennel where your puppy is matched with another puppy in training. If you’re interested I put together a video when I dropped off Dublin at guide dog college (GDA). I don’t have kids, but I imagine it’s a lot like sending your kids off to college. It’s tough to let go, but you want them to move on and do well at school and in their career. I always give my pups a hug and tell them to do well. So far all of my puppies have gone into their kennels happily playing with their new kennel mates. It makes it a little easier to see that they are happy in their kennel and have found their new best friend (typical Lab). TM: Is there anything else you think people should know if they are interested in becoming puppy raisers? CM: If you’re interested in becoming a puppy raiser, start participating today! We have events and outings nearly every weekend. 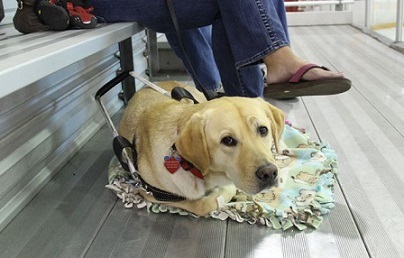 Go to a guide/service dog graduation. Go to a guide/service dog group meeting. Go to a guide/service dog puppy kindergarten. All of these things will give you a better idea of what puppy raising is all about. It also gives you a chance to speak with current puppy raisers. We have raisers in our group who’ve raised a dozen or more puppies over the past 30 years! One final thought: When you do become a puppy raiser and you bring your first puppy home, always remember: Patience, Persistence and Consistency. If you’re interested in becoming a puppy raiser please let me know and I’ll see what I can do to help you get started. Have any of you thought about becoming puppy raisers? What questions do you have? This is so interesting. We live in CA, where the Guide Dog for the Blind is located. I actually interviewed with them a few years ago with the intent of being a puppy raiser…but life got in the way – our dog Tino went blind and it just wasn’t the right fit anymore. But now, maybe I’ll rethink. I would love to do this someday! I guess the thing that has me hesitant is I think I would feel bad for Ace. The puppy would get more attention and would get to go everywhere. I want to spend that time with my own dog. He would be a good influence on the pup, though! So timely for me! Due to some work and life changes, I’m in a position to be raising a puppy in the next 1-2 years. I’ve been carefully considering whether it’s a good idea, and I just started weighing the idea of puppy raising vs. adding to our family. I have looked into puppy raising in the past. Didn’t have the right schedule or situation for it before. I do think it’s challenging to juggle with younger or more active dogs of your own. I also worry about shortchanging my resident dogs, no matter what type of new dog I bring into our house – foster, adopted, new puppy, dog-in-training, etc. Part of the decision for me is what I think will work best with the two I have (and the humans!). The other aspect I’m not as confident about is that puppy raising is about teaching a dog to be a working dog (and a very specific subset of working dog) while following someone else’s long-established training plan. There is a very good reason for why things are set the way they are, and the expectation of conformity. It’s not remotely like training dogs to be polite family pets, helping shelter/rescue dogs find a forever home or training for dog competition, even at a high level. It’s not even the same as training your own working dog for a specific task (e.g., hunting and gun dogs; herding for farm work). When you sign up, it’s a 100% commitment to raise the dogs with the training methods and rules of the organization/club. Intellectually, I realize how important this is. But I wonder how quickly I’d adapt to doing things according to the plan, especially if I’m tired, acting on instinct or juggling family dogs who’ve been trained differently. That’s something I hope to explore more of with existing puppy raisers who had lots of prior different dog experiences. I’m sure you’re not the only one with those concerns. I’ll be looking forward to hearing more, no matter which type of dog you end up adding to the family. I’m kind of in the same position. I’d like to add another dog, just not sure if I want a foster dog, permanent dog, puppy in training, etc. I think the best be for me may be to adopt a middle aged or senior dog. Puppies in training are a lot of work and definitely not for everyone, but one of the coolest things is seeing them graduate and meeting their new partner. It’s life changing seeing the puppy you raised for 16-18 months help a person regain their independence. That’s a great point about these schools having long established training plans for their dogs and puppy raisers. When I decided to raise a puppy for Canine Support Teams after raising 4 puppies for Guide Dogs of America one of the reasons was because I wanted to try a different training plan. I looked at several different schools before settling in with CST. Every school does things differently and you are correct that the rules can sometimes be very strict with very little flexibility. GDA uses training collars (choke chains) with all of their dogs, but some of the other schools I’ve seen use gentle leaders, martingale collars, and no-pull harnesses. If you’re interested in puppy raising I’d make sure and check out the different schools in your area to find one that has a training program that best fits you. I had the same thoughts about Linus when I first started puppy raising. At the time I made a point to try and do more things with Linus since my puppy in training spent the better half of the day with me. I got him more involved in training classes (obedience and K9 Nosework) and I would make it a point to take him out and about when I had the chance. Also, several of our guide dog outings allow us to bring our own dogs like our ferry ride to Balboa Island, scavenger hunt at fashion island, Irvine Park Picnic, and some of the dog walks for charity. Guide Dogs for the Blind has an event called Fun Day every year and I hope some day I can attend. This years 56th annual Fun Day is scheduled Saturday, July 12th 2014 in San Rafael. I probably won’t be able to make it this year, but if you’re right around the corner I bet it would be a great way to meet some of the puppy raisers and find out more about their program. Thank you for all of this helpful information! Very interesting interview. What a rewarding thing to do! Wow – Solana Beach. Had no idea you were so close. Yeah, maybe we can meet up some time. Thanks for stopping by Pooch Smooches! One of the most rewarding things I’ve done is raise a puppy for 16-18 months for someone else in need. People always ask how I give them up? It’s difficult, but watching your puppy graduate as a working guide dog with his new partner is priceless. Yay for Colby – He rocks! I was lucky enough to meet him a couple of years ago at Blogpaws – he does awesome work with the pups! Hi Snoopy! I was the lucky one to meet you! I hope all is well. I need to visit your blog for some mischief! By the way, are you going to BlogPaws this year? I don’t think it’s in the cards for me, but you never know. We might be at the Garlic Festival this year so I might have to contact your Mum. Take care! I’ve always dreamed of being a puppy raiser for Guide Dogs of America. Maybe one day I will! Let me know if you have any questions about puppy raising or Guide Dogs of America. If you’re in the Orange County area and if you’re interested I can send you some information about our meetings and upcoming events. We’d love to have you onboard as a puppy raiser!